Sunny Health & Fitness Folding Upright Bike with Arm Exerciser is a unique folding exercise bike that gives you the ability to have an upper body workout as well as lower body one. You can choose to exercise both at the same time or one at a time – similar to fan bike but with 360 degree handles (crank system) rather than the back and forth motion of fan bikes. It gives you the opportunity to burn more calories and tone the arms that doesn’t come with other foldable exercise bikes. You do miss out on having handlebars to grip or rest a book or tablet on, this is what you give up for being able to burn more calories with the upper/lower body workout in the same time as just being able to pedal – it can help you get into shape quicker making it a possible time saver as well space saver. In our review we look at the arm exerciser as well as it performs in other areas to determine if it is a good buy for the home. At first glance it doesn’t look like it will hold you steady and secure. But the steel frame aalong with the stabilizer bars are enough to keep the bike stable and sturdy while you exercise. It won’t rock or wobble when used on a flat surface. The floor does need to even or it will rock and it doesn’t have levelers to balance out the bike. If your floor isn’t quite even then a rubber exercise mat can help to prevent that side to side movement you get when something isn’t quite even. The bike hasn’t been around for that long so there isn’t much data to go on as to how durable it will be. However, experience with other Sunny Health & Fitness Exercise Bikes is that they are well made and can be used for a good number of years. The seat height can be easily adjusted to accommodate people of different heights. Although there is no indication from the manufacturer (I did ask) the usual height range is between 5ft 3 ins and 6 ft (with one review saying even at 5ft 7 ins it was not able to be adjusted for them – I don’t this can be right). Below 5 ft 3 ins you may struggle to reach the pedals (depending on leg length). Over 6ft you are going to be cramped and not getting full extension of your leg. Making the adjustments involves loosening the adjustment knob and pulling to release the pole and then sliding poles to get the seat to the desired height, then re-inserting the pin into the pre-set holes and tightening up in place. The bike can be used by multiple users as this only takes normally less than 30 seconds to do. There aren’t markings on the pole to help with returning to your setting so you need to remember where you set it – you could count the holes to help or use a permanent marker to mark your setting. The x-bar design can make it difficult for shorter people to get on the bike as you have to bring your foot up high to get it over the center of X-bar. Some people use a small step stool to help with this. This is a problem with all x-bar folding exercise bikes. The exercise arms resistance can also be increased by turning the knobs at the top of the console although these don’t have the level marked. The resistance at the lowest levels is very light and is almost like there is none. Most people use the resistance level on these bikes between 3 – 6 to get a good seat on. At 7 – 8 it can start to be a struggle to maintain your pace and pedaling may start to become choppy with it slowing/speeding up as you move through the pedaling cycle. However, the bike is not designed for tough or intensive workouts. It’s for light to moderate exercise to get in or stay in shape. The resistance levels are not tough enough. If you are looking for upper/lower body workouts with more intensity then a bike like the Airdyne AD6 is one that can do that for you – it is noisier and has air resistance that can’t be manually adjusted – it just gets harder the faster you pedal and move your arms. It is a low impact exercise which can help when you’ve injuries including rehabbing arms as well as legs (seek medical advice first) although the manual does state that it is not for therapeutic use. The bike has a belt drive to connect the pedals to the flywheel – all are enclosed in the casing. It is very quiet and no maintenance is required. Being enclosed keeps it out of the reach of children and pets and stops you from catching your ankles or clothes in it. The pedals are not below you as they are on an upright bike but out in front. Some people don’t like this and find it puts too much strain on their glutes but most find it comfortable enough to get a good workout. The pedals themselves are textured for keeping your feet from slipping of them. The pedals don’t include straps but in most cases you should find you’ve no problem with getting the grip you need to keep your feet on the pedals. They’re designed to be used with shoes and athletic shoes are a good choice. Unfortunately the arms don’t lock although you can tighten up the resistance when you don’t want to use them so you can get a bit of support as you pedal. It’s not designed for standing on the pedals like you can on a spin bike or fan bike – you are too close to handles anyway. It is made for sitting and pedaling. Seat. Many people with find the seat uncomfortable. It is that way with any Sunny Health & Fitness exercise bike seats. To help you can buy a gel seat cover or padded bike shorts. If the seat is too much it is possible to replace but it isn’t straightforward as it is attached to the seat post with three bolts. To do it yourself you probably need to buy a universal exercise bike seat adapter and attach this to the seat post so you can then use any standard fitting bike seat. Noise. It is a quiet bike and you can use it without disturbing others in your home. It does make a little noise mainly from the arm exerciser. You can still exercise and watch the TV without turning up the volume. You probably won’t be able to use the arm exercisers in a bedroom while someone is sleeping. It can be used in an apartment without disturbing the neighbors, if you are concerned about any vibration through the floor a rubber exercise mat will normally sort that. Handlebars. It doesn’t have normal handlebars as it has the arm exerciser and these aren’t able to be fixed in place, so you do need to be able to steady yourself to use the bike. The handles do have grips on them which make them easier and more comfortable to grip as well as prevent blisters. Dirt and Dust. It doesn’t generate much dirt or dust so it won’t be adding to your chores too much. You do need to wipe it down to remove dust and sweat to keep it in best shape – as sweat can be very corrosive. Sweat can also drop on the floor too and the best thing to prevent damage is to put the bike on a rubber exercise mat. It folds up to around half its size making it easier to store out of the way in a closet or behind a door. It isn’t really small enough to fit under a bed. Folding up the bike is quick – you remove the holding pin at the center of the x-frame and push the stabilizer bars and reinsert the holding pin and it is ready for being stored and/or moved. On the front stabilizer bar there are transport wheel that can help to make it easier to move the bike. They work well on most surfaces but on soft carpet they are likely to get caught up as there isn’t much clearance – so you may need to drag or carry the bike – it weighs 39 lbs. The bike comes partly assembled. To complete the assembly takes around an hour. The tools needed for the assembly are included. You are required to add the pedals, handles, seat pole, seat, stabilizer bars and console to the frame. The instructions is reasonably clear and the parts go together without too much trouble. One person can do it on their own however holding the bike while adding the stabilizer bars is easier if there is two of you – it can help prevent any injury or damage to the bike. The console has the arm exercisers at the side and their resistance knobs at the top of it. The monitor and screen is in the lower half. It is battery operated and takes two AAA batteries that are easy to replace as required. It measures time elapsed, speed, distance, RPM, calories and odometer (cumulative distance). You can set to display just one of them or to scan through them every few seconds by pushing the mode button beneath the screen. You can reset the measures by holding down the mode button for 3 seconds. The monitor will start when you start pedaling or push the mode button. It turns off automatically if there is no pedaling for 4 minutes. The measures other than time elapsed are estimates and should be taken only as a guide and a way of tracking performance. It would appear from the manual the measures of speed/distance are in kilometres. It is not backlit so it can be difficult to read the numbers in poor light. The upper arm exercise handles don’t connect to the monitor, so you don’t get a reading on the calories burned. The information can’t be uploaded to a fitness account so this all needs to be done manually if you want to record and track progress over time. The bike does not come with any accessories (other than the arm exerciser). It is possible to rest a water bottle in the frame and it should stay in place as you ride. For anything else you need to exercise near a table to have things like your phone or TV remote close at hand. The instruction manual has only a little guidance on how to use the bike but with example workouts or how to fit the bike properly. It does tell you how to make the adjustments but not to what to set it to, for the best fit. There are very few customer reviews online. For the most part they are positive across the internet. Of the bad ones, one is about it not being for the tall (it says it the bike not for people above 5 ft 7 ins, which is contradicted by an answer which indicates it is suited for 6ft which is my guess for the bike). 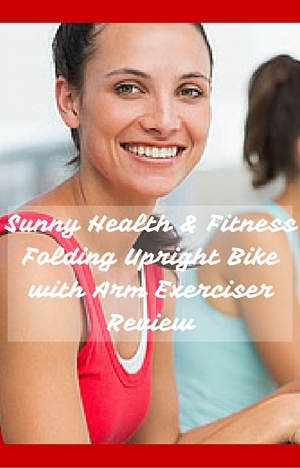 With the lack of reviews overall – I found 13 – I’ve looked at reviews of other Sunny Health & Fitness folding exercise bikes and they are positive with them getting positive ratings overall, I would think this will be the same as more people buy and use this bike. This is an affordably priced bike that comes with an added feature that doesn’t come with folding exercise bikes that allows you to get upper body exercise as well as a low impact lower body exercise. It still is reasonably priced compared to other similar bikes. When I checked online Amazon had the offer where it qualified for Prime and free shipping. To me, the best feature of this bike is the ability to exercise your arms enabling you to tone and strengthen the arms while you work your lower body too. I’m not sure why more bikes don’t have this as you can burn more calories without spending any more time on the bike. It would be better if the arms locked so you can use it like an exercise bike when you want to just exercise the legs (you can do this you just don’t somewhere to rest your hands on a stationary surface). Somewhere to put your tablet, remote or MP3 player would be good too. It’s well put together and it is a good bike for an overall light to moderate workout (it’s not for those wanting tough or challenging workouts). It holds you firm and is quiet so you can get on with your workout at home. It can be used by multiple users and its affordable price makes it a great option for the home.